[top]: Detail from the etching (1566-1568) The Image Breakers by Marcus Gheeraerts the Elder. [center]: Illustration (1876) by Henry Holiday to the chapter The Barrister’s Dream in The Hunting of the Snark. C. L. Dodgson did not want Henry Holiday to depict the Snark in the illustrations to The Hunting of the Snark. But Holiday was allowed to let it appear veiled by its “gown, bands, and wig” in The Barrister’s Dream. 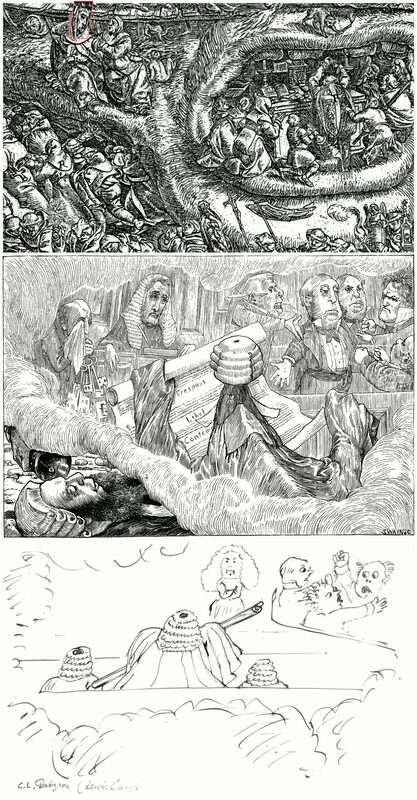 First C. L. Dodgson (Lewis Carroll) defined the concept [bottom], then Henry Holiday did the artwork (including the allusions to Gheeraert’s “head” [top]) and finally Joseph Swain cut the illustration [center] into a woodblock. THE RIDSDALE JUDGMENT: THE TESTIMONY IT AFFORDS TO THE PROTESTANT CHARACTER OF THE CHURCH OF ENGLAND. BY THE REV. G. W. WELDON, M.A., VICAR OF ST. SAVIOURʼS, CHELSEA.